THE EDITOR: I had worked with a respected editor prior to submitting my manuscript, so I did the final editing myself. SUMMARY: On Memorial Day, a series of bomb explosions shuts down major cities across the US. Her apartment in ruins, Sabine flees Washington DC and begins a grueling journey on foot that brings her to West Virginia, where she finds safety at an abandoned farmhouse with other refugees. For Sabine, family is a vague memory―she can’t even remember her last name. Without an identity, she hides, but later slowly begins to recall her past and wonders if her family is alive. Even in harrowing times, Sabine’s desires to belong and to be loved pull her away from shelter. THE BACK STORY: During the Cold War US citizens were preoccupied with the Red Menace and spy novels became popular with readers. Now there is concern about the degradation of the planet and global terrorist attacks. Since 9/11 there has been a growing preoccupation about terrorism. I wanted to write about an event that affected the country. In 2008 I decided to take on a big theme: terrorism and peoples’ responses to the fear and deprivation a crisis brings. I began writing Shelter of Leaves that year, and the growing concern about terrorism is reflected in the book’s imagining of a world of chaos. In my career as a therapist, I worked with people who had lived through various traumas and am familiar with the types of defenses people use to protect themselves. I created Sabine from experience with how people work to heal themselves. I put her in a chaotic situation and then created her inner and outer struggles as a way to discover how a previously traumatized person would respond to a crisis that would trigger more trauma. The book explores whether healing is possible and what it takes to heal and to survive. 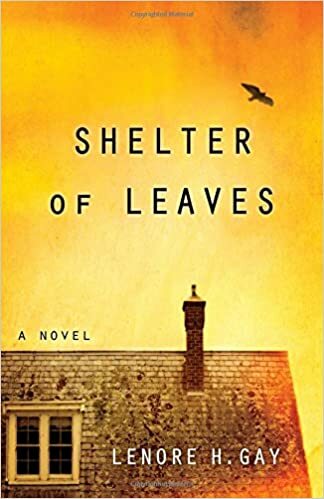 WHY THIS TITLE: The title refers to family and connection providing shelter and strength for survival—the many leaves and connecting relationships that can support a person recovering from trauma. WHY SOMEONE WOULD WANT TO READ IT: People who are interested in themes of surviving, searching, finding…will be interested in the book’s characters and the suspense of the action in a time of social chaos and danger. Sabine as a woman who finds her way forward from past trauma, especially during a threatening time is an interesting character for a modern novel. AUTHOR PROFILE: A native of Richmond, Virginia, Lenore Gay is a Licensed Professional Counselor with master’s degrees in sociology and rehabilitation counseling. She has worked in agencies and psychiatric hospitals, and for ten years she maintained a private practice. The Virginia Center of the Creative Arts (VCCA) has awarded her two writing fellowships. Her poems and short stories have appeared in several journals. Her essay “Mistresses of Magic” was published in the anthology In Praise of Our Teachers (Beacon Press). Her story “The Hobo” won first place in Style Weekly’s annual fiction contest. She is a volunteer reader at Blackbird, An Online Journal for Literature & The Arts. Shelter of Leaves is her first published novel and she is currently at work on her second novel. LOCAL OUTLETS: Shelter of Leaves is available in Richmond, Virginia at independent bookstores: Chop Suey Books and Fountain Bookstore. WHERE ELSE TO BUY IT: Order Shelter of Leaves online at Amazon, Barnes & Noble IndieBound and Books-A-Million. PRICE: $16.95 for Paperback and $9.95 for Kindle and eBook, online discounts available for both formats. Wonderful book and a great review!